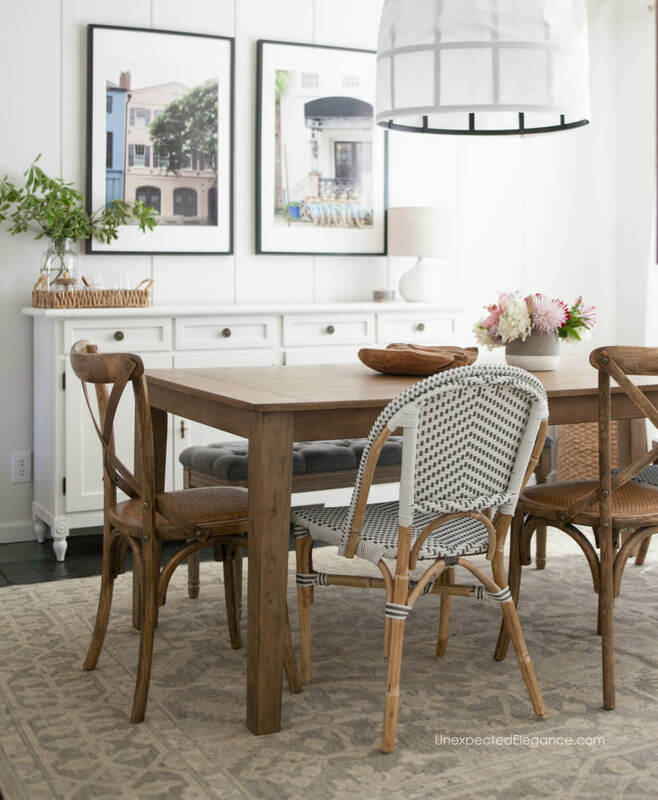 Looking for a quick dining room update for your home? 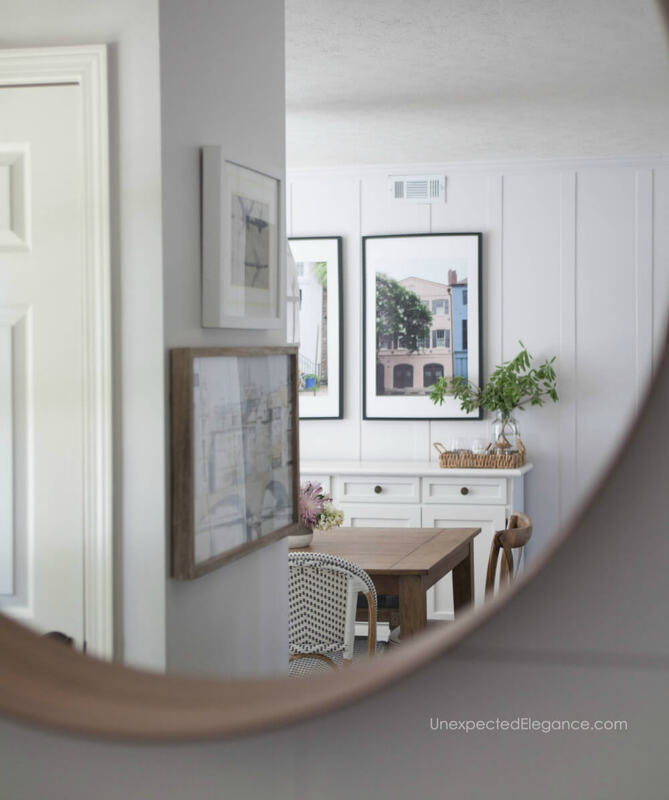 Check out how I pulled mine together and get some inspiration for your space! My dining room has really transformed over the years. 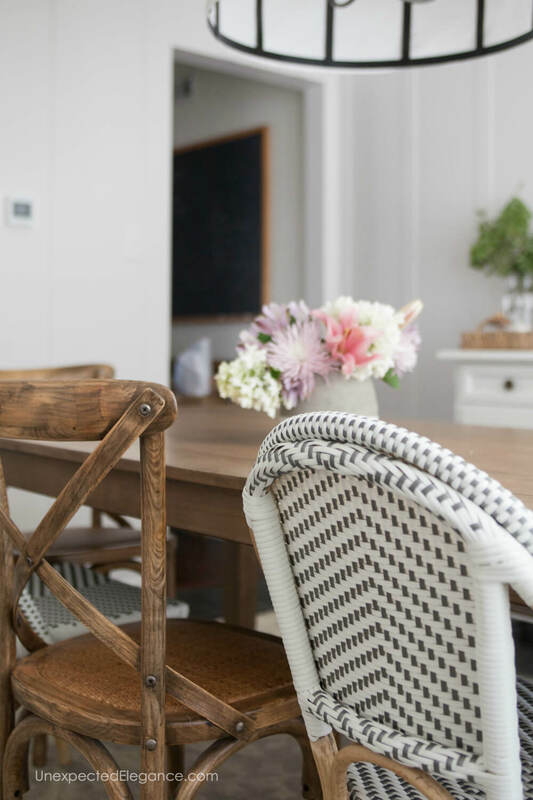 One of the best parts of having a blog is being to look back and see how far my home has come…and how my style has evolved. Honestly, I used to get embarrassed by the quality of my old photos and my style but I’ve learned to be proud of the journey. We all grow as we learn to do things and that’s true with decorating too! I liked how the room turned out (at the time), but as we lived in the space I decided some things needed to be changed. The “buffet”, aka shelving, was OK for function but it really wasn’t what I wanted for the room. I wanted something that was more of a serving height and would hide the clutter. However, the wall treatment or color of the walls was NOT something that I wanted to change. What kicked off this makeover was the buffet. I found at the Ballard Outlet and it was the perfect shape and size… but it needed some work! You can read all about the buffet transformation HERE. 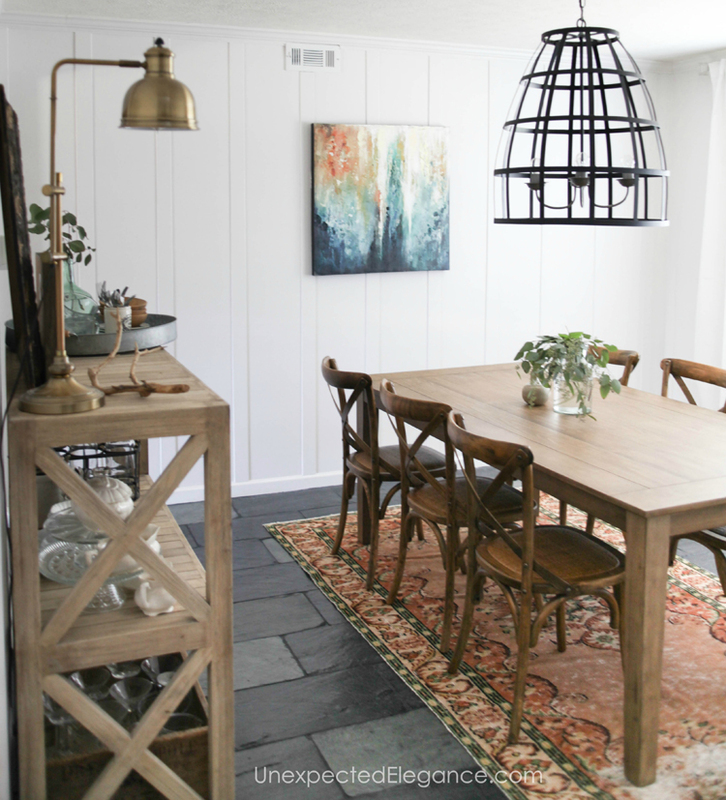 The piece that really brought the room together was the RUG!!  Isn’t she beautiful!?! It is a hand-knotted, wool rug from Ecarpetgallery.com. 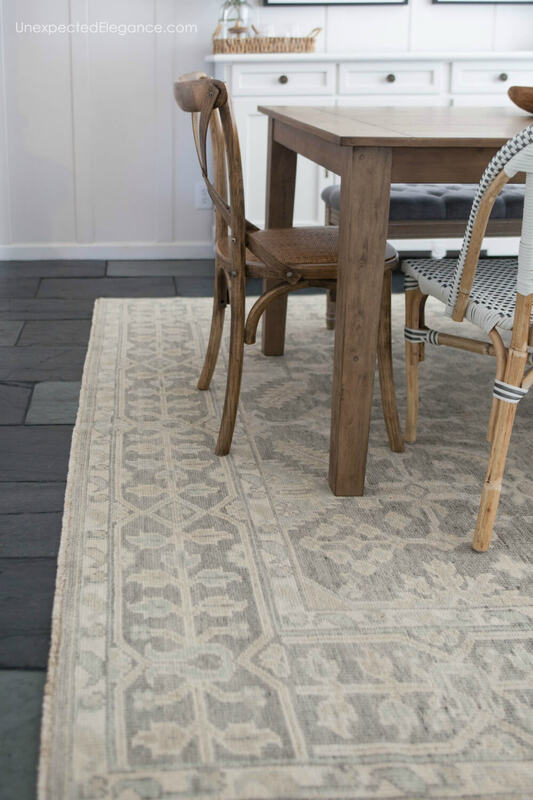 They are my favorite rug resource and I have bought quite a few from their site over the years. I LOVE their options and quality. I kept the same light fixture but decided to soften it up. I made this simple cover for it out of white muslin. I’m not sure if it will stay long-term, but it works for now. The table and wooden, cross back chairs stayed, but I bought two new bistro chairs. They were on clearance at HomeGoods and brought in some texture. The bench was previously in my bedroom and I’m glad I kept it! 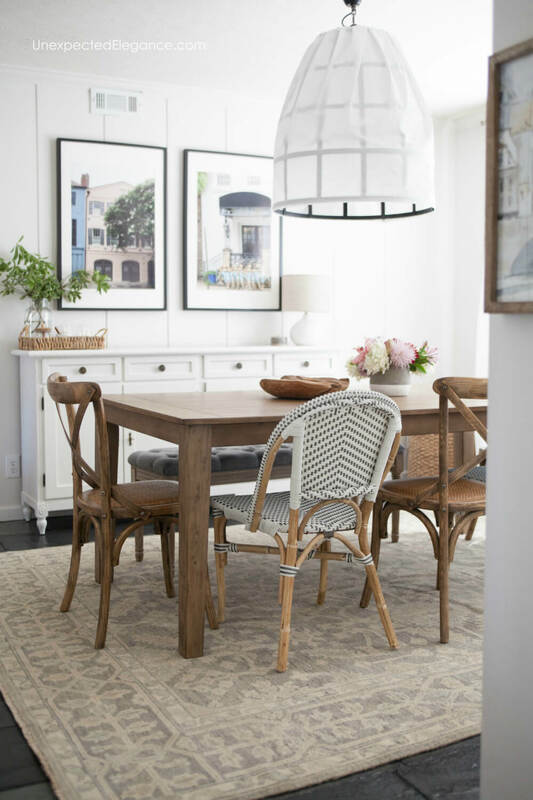 The space between the buffet and the table is a little light, so the bench helps visually. 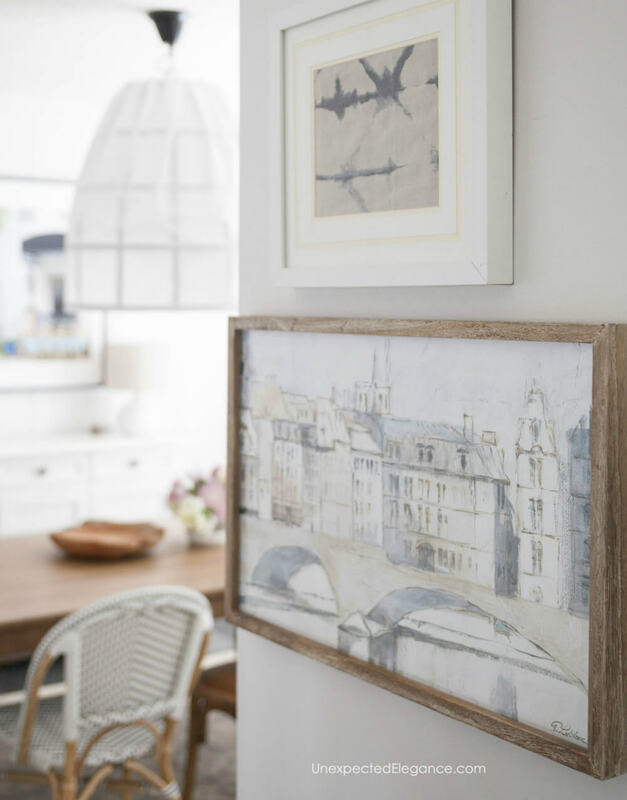 Last, but not least…I used inexpensive Ikea frames and had pictures from my recent trip to Charleston turned into artwork. They add color and finish off the room! Where did the light fixture come from? It’s so cute! 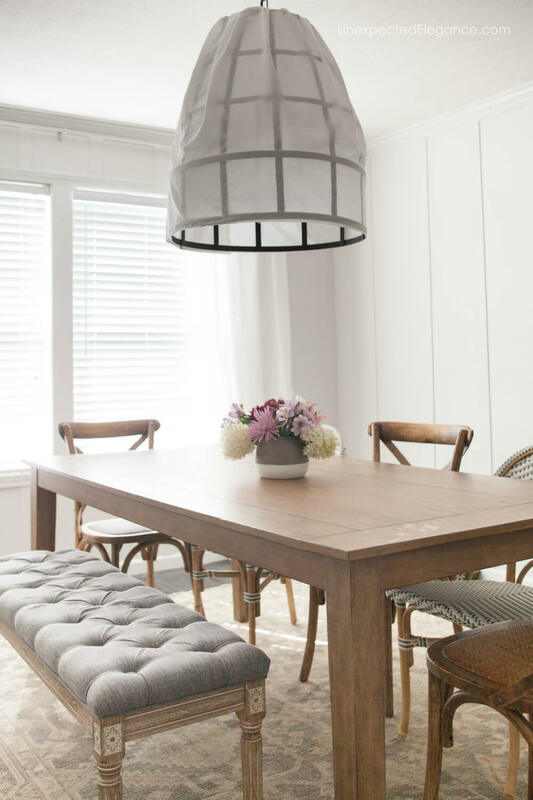 Just a thought from a fellow decorator and D.I.Y.er… What do you think about weaving some not too scrunched up strips of muslin type fabric horizontally through your black lamp cover? The idea flashed into my head when I saw the white woven chair with the light in the picture. I love your room! Fabulous! Oh, I forgot that I wanted to thank you big time for the reference to a quality place for rugs!